It’s when we live out of our suitcases. Following an itinerary away from home is stressful enough. Time shouldn’t be spent worrying about luggage. It should be used to get things done. Packing correctly helps eliminate some of the obstacles, but using the right type of luggage can reduce stress dramatically. The first criteria in selecting luggage should bequality. This article will help you to stay organized and talk about the 6 types of luggage most suitable for a man on the move. Never want to forget anything again? Download the RMRS packing checklist to keep! Click Here To Download. What defines the perfect carry-on? First, quality wheels. A carry-on will be with you throughout airport navigation, takeoff, and landing. Wheels will help avoid the hassle of carrying an extra bag. Options include 2-wheel, 4-wheel, and 8-wheel designs. The 2-wheel carry-on is best for men who prefer to pull their luggage as opposed to pushing it in an upright position. The 4 and 8-wheel are better for the man who wants to keep their luggage standing straight up. Each one works, but it comes down to personal preference. Second, look for a sturdy telescopic handle made from steel. Adjust the handle to whatever is comfortable for your height. It should sit comfortably at arm level when walking through the airport. Third, the handle should be durable. Carry-ons can get heavy and your handles need to support the weight. A key indicator of quality handles is double stitching paired with metal rivets for additional reinforcement. Finally, compartment spaces. A carry-on bag should have plenty of exterior pockets to store essential items like a laptop or camera if you are carrying one. Need to remember what to pack? One option is to download our checklist of everything to include inside the bag. Another option is to find a bag with a built-in checklist to make sure nothing was forgotten. Look for the carry-on bag or suitcase that will satisfy the TSA and airline restrictions. Most airlines allow passengers to carry a bag no larger than 22″ x 14″ x 9″. Additionally, know the weight limit of your carry-on. The last thing you want is to get hit with a “second bag checked fee” because your carry on was too heavy to bring on the plane. Recently, international airlines have been offering incentives to passengers who opt out of checking in their luggage. There’s more room for freight and less chance for injuries to baggage workers. The advantage of packing all your items in a single carry-on bag are – increased mobility, bypassing baggage claim and saving on baggage fees. On a flight, passengers are allowed to bring one carry-on along with a smaller bag containing personal items. It needs to be small enough to fit under the seat in front of you. The three most common types of convenience bags are leather briefcases, backpacks, and flight bags. I’ve talked about the first two before so let’s focus in on the flight bag. 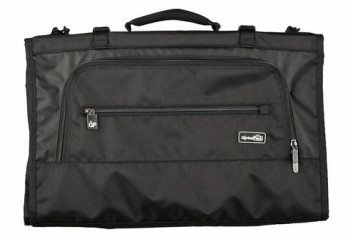 A flight bag is designed to connect to the carry-on for easy transport. It can also attach to your tray table of the airplane for easy access to all your flight essentials. 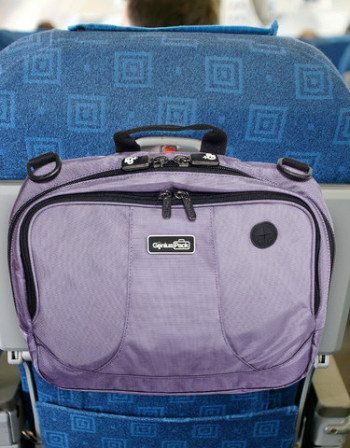 Most flight bags include spaces for passports, tablets, magazines, headphones, and mobile devices. You know, all the important things you need on a flight! A Dopp kit’s job is to protect your clothing from any liquids that you decide to carry. Storing your grooming products in separate compartments will help eliminate the chance of gels leaking out onto your expensive clothes. To further prevent this, store all of your bottles and tubes upright. One step further is to find tubes that are leak-free and compliant with TSA fluid ounce restrictions. Look for: A grip handle, a roomy main compartment, and a strong zip closure. Any bag that is 23 inches or larger will fall under the checked luggage category. A scaled-up version of a carry-on bag, your large suitcases should have a retractable handle to pull along on durable wheels. Unlike your carry-on luggage, a large suitcase is not restricted by size limitations (assuming it falls within general size guidelines). Instead you have to pay attention to the weight of the packed suitcase. When packing larger luggage keep the weight limit in mind. Airlines tend to charge fees for heavier bags. Most airlines are free up to 50lbs but always do the research before shoving everything into one bag. You don’t want to get hit with unnecessary baggage fines. When purchasing a suitcase, think ahead to how you transport it from your house or hotel to the airport and your own capabilities. A 25-inch suitcase is a lot easier to fit into a taxi than a 30-inch suitcase, and obviously a 6’8″ muscular man will find it easily to handle the larger bag than a 5″2″ petite woman. 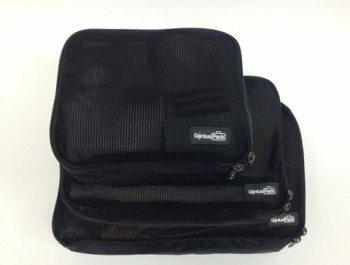 Outside of the Dopp kit, there are additional bags to help protect expensive items. Each one plays an important role protecting the most expensive items that need to be handled with care. The two biggest functions are protection andconvenience. A shoe bag is usually semi-stiff and made from tough nylon or canvas. Protect your clothing from your shoes with a lightweight, inexpensive drawstring bag designed to keep the residue of your travel walks away from the rest of your clothes. Also, protect your leather shoes from deep scratches, tears or creases which can ruin an expensive pair of shoes. Shoes can also be difficult to pack sometimes. Having them in a separate bag makes it convenient for packing them into a carry-on or a duffle bag. Garment bags offer protection to your most expensive clothing as well as keeps them from wrinkling. It separates your suits, shirts, and dress trousers from the rest of your luggage where dirty clothes are or leaks are prone. In addition, look for a bag with designated compartments for accessories like ties, handkerchiefs, and belts. A garment bag also allows for everything to lay flat, keeping your clothes wrinkle free. Your suits stay intact and ready to wear as soon as you arrive at your destination. The main functions of compression cubes are to save space, organizes items, and keep your clothes from billowing with air. Absorbing all the air from inside the folds creates more space for other items. Imagine fitting 13 shirts into a compression cube and only packing the cube. When storing in compression bags, divide your clothing into categories to organize everything neatly. When you unpack you can find your shirts immediately without having to dig. The end result is a vacuum-sealed-like bag that occupies less space and keeps your clothes from puffing when you fold and unfold them. A duffle bag’s primary benefit is space. Most commonly associated with sports and travel, duffel bags are a great secondary option for carry-ons or business trips where you need to pack light. For travelers, a wheeled duffel bag is your best option for convenience and space. There is one large pocket that fits your gear and several other compartments of varying sizes which are useful to store chargers, important documents and more. Soft sided luggage refers to canvas-like or Nylon baggage that flexes under pressure. The majority of luggage is softside, and it doesn’t have the firm outside structure that hardside cases do. Softside luggage is also more flexible than hardside. It’s simpler for these soft pieces of luggage to fit into tight spaces or collapse to create more space. Softside luggage is more likely to be expandable. An expandable case allows you to bring back more than you left with. It can save you the expense of buying a second bag after some overseas shopping. Another advantage of a softer case is it tends to be less likely to mark. Stains are easily wiped off with a wet towel most of the time. A disadvantage of soft side luggage is a lack of protection. If you’re bringing fragile items on your trip your best bet is to go with hard side. Hardside luggage refers to a shell-like exterior. The exterior shell is usually made of lightweight polycarbonate and without the extra frills such as expansion pockets. Protection is the primary reason for choosing a hardside suitcase, so packing fragile and delicate items are less of a worry. A disadvantage of hardside luggage is that there’s no flexibility to fit them in tight spaces. You need to be sure the storage compartments (mainly for carry-ons) and trunk spaces will be large enough to hold the bag. When traveling, organization and convenience are key. The two weeks spent living out of a suitcase will be much less stressful if you pack smart. Business trips are meant for business. Take the worry away by using your checklists and the right luggage.